In order of rough appearance in history, here are four types of myth. All of them, it should be obvious, are meaningful: they provide their users with what Kenneth Burke called “equipment for living”. They only survive if they do some good… or at least minimal harm. Cultural myths: the point is to remember them. Here the saying of the myth is also what the myth is for (cultural memory). This myth has to be exclusive, because remembering and saying the myth is coexistent with what the myth is about. Broadcasting the myth and having it replicated is not the goal. Its purpose is much more closely tied to its form: keeping the tribe going and constituting what it means to keep the tribe going. Indigenous Australian songlines are a fantastic example. The author of such myths is the geography and history of the tribe: over generations the stories are winnowed by experience to be concise, memorable and useful. They are generally self-contained and do not comment on other cultures or other myths; they weren’t made to compete with other myths. In this sense even though they are a mixture of metaphors, aesthetic elements and useful knowledge of the world, they are able to be taken “literally” because there is no challenge to their status. There is no difference yet between metaphorical and literal because no such difference is applicable. Grand narratives.1)Obvi these are super-rough. There are examples that blur the boundaries, that mix and match and of course there are sub-types within all these types that also represent important distinctions, yada yada, yada. The point here is to achieve social control or cohesion, e.g. major religions and big political ideologies. Authors can be a committee (often separated in time and space) or a single person. These seem to reproduce best when they have built-in mechanisms that aid reproduction, employing the same underlying logic of a chain letter. The Quran opens with, “This book is not to be doubted,” which heads off a potential threat to non-reproduction and later parts of the text describe mechanisms for its own reproduction. Having emerged in multicultural, post-tribal environments, these myths also aim to supersede other myths. By guarding against non-belief, the Psalmist tells us that only the fool doesn’t believe in god (Psalms 14:1) — but this also tells us there were non-believers around or believers in other myths. The Bible explicitly and implicitly claims more than metaphorical truth; it competes openly with rival myths and other claimants to ultimate truth. Fictions set out to uplift or provoke people, sometimes purely for short term entertainment. The creator is normally an individual and they generally want the myth to spread promiscuously, often for personal gain. These myths entail the difference between myth in general and something that is not myth — irl or reality. The Greek idea of mimesis involves using art to mimic reality: this presupposes a non-fictional world that fiction is capable of mirroring. Trans-myths attempt to surpass the very basis of how other myths are created and openly assess rival myths. This sets themselves against myth in general. They probably deserve a new name, even though they’re sort of built out of earlier kinds of myths. Examples are scientific theories, evidentiary accounts in legal systems, academic histories and philosophical ideas. Perhaps it’s cheeky to call these a kind of myth at all, considering that it is precisely the features they don’t share with the others that make them unusual. What do they share? They are meant to be usable knowledge. But they are the least concerned with longterm fidelity of copying, because they are meant to be constantly updating. The other three types are precisely designed to not change, or at best change very gradually. None of the others contain within them the key to their own debunking. A few things occurred to me. When people try and tell the stories of traditional cultures it’s obviously a vexed endeavour. It seems admirable to try and amplify an historically marginalised and often deliberately exterminated culture. But retelling traditional myths misses a point because telling them as truths (the way they are seen by their adherents) in a modern context seems ludicrous, because modern people assume a fiction/non-fiction divide (that can be porous or on a sliding scale, but there nonetheless). Telling them as fictions, to compete in the crowded bazar of fictions already available, where people like us mine them for any meaning , only to move on to the next cultural item to be sucked dry, is also tricky; they might not hold up and the custodians of these myths 2)The custodians are interpreted in some progressive circles as owning the IP of the myths, but perhaps it’s more accurate to say they are the IP. probably don’t want this fate for them anyway. They also remind us of a time when representations, myths, narratives — whatever we call them — were not so clearly demarcated from the things they represented or narrated. Only since the urban civilisations of the Axial Age, or thereabouts, have these things been clearly distinct. 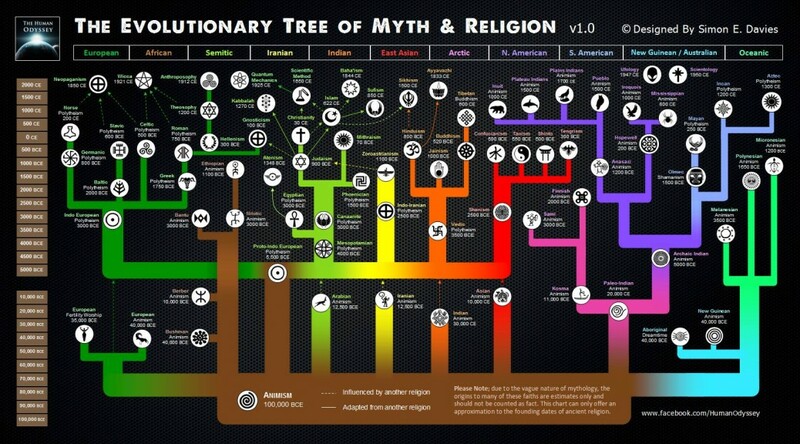 But the older style of myth is much closer to how we think (how our brains represent things), how animals use signals and how natural information works (DNA transcription). The ancient idea of a spell is instructive. In a spell, saying it makes the thing it’s about happen. There’s no distance between the text and the effect, the form and function. But in modern fictions, discourses, narratives, textbooks, dissertations, think pieces, etc. the symbolic content (the actual sounds or markings) of the text can be totally unrelated to the effect or action it’s trying to achieve, which could be to change someone’s mind on the other side of the world at a later date, or to describe something remote from both the writer and reader. We’re so used to this latter mode of representation, that we assume the brain and other naturally evolved things must work that way too. But the kind of meaning we find in DNA is like a spell. Saying it (mRNA chemically interacts with it) makes the thing it means (a particular sequence of amino acids to build a particular protein) happen. Likewise a brain region doesn’t view or read the meaningful information it represents: it is that meaningful information. It might not seem like that to us when we “reflect” on our own thoughts, but when you focus attention on something, there is a network of neurons whose activation is the attention focused on that thing. Contemporary philosophers like to point to this kind of thing and say, we took a wrong turn with the ancient Greeks. Apparently when we set up this whole mimesis thing we got left with a distorted view of reality, mistook our scientific theories for a mirror of nature and lulled ourselves into the idea that our rationally arrived at knowledge could represent a world “out there” from some privileged position “in here”. They’re right about the diagnosis and the symptoms, but not necessarily the prognosis. After all, look how powerful is the trick of separating off the representation from the represented, just to buy some room while you sort out rival myths. The thing about type number 4 (trans-myths) is that they go up one more level than 2 and 3. Fictions and grand narratives assume truthful versus untruthful. But trans-myths like history, legal systems, science and philosophy all go further by establishing a spectrum of truthfulness. And it’s not naive either. It’s multidimensional. Some myths are true in one way and not another. Some have metaphorical truths, but not literal or vice versa. These trans-myths also have ways of interrogating their own mythical status. If you ever wanted to judge one myth against another, in any way, you won’t find a framework to do so within cultural myths, or fictions and grand narratives will only give you a default way of showing why all other myths are blanket wrong and bad.3)Hence if you want to judge the institutions of science, you use science studies or the sociology of science, not Aztec myth or even a great fiction from the past like King Lear. The cultural myth and the fiction simply don’t have any content capable of grappling with the new “myths” of science. The reason, obviously, is that they were composed before the advent of professional science so couldn’t incorporate anything like the high-level, abstracted, generalisable, relativistic perspective found in modern social science, legal theory, philosophy, and so forth. Sadly, this also means that traditional peoples struggle to analyse the colonialists and anthropologists who analyse them — and also classify them, rule over them and, in the recent past, exterminate them. Also sadly, even governments who have belatedly, begrudgingly — and often deliberately ineffectively — tried to help preserve traditional cultures, have often failed to recognise that they’re not static either. Recently I’ve been checking out anthropologies written by members of a traditional culture, that are able to gain more access to that culture than would outsiders and also comment on anthropology. Pretty interesting. Even this typology I’ve outlined here doesn’t even make sense within the purview of anything other than a modern trans-myth, such as anthropology, or philosophy, or something. It’s the open, evidentiary nature of trans-myths that sets them apart. It makes them open to new meanings, new knowledge. Cultural myths and grand narratives, however powerful, are essentially closed. Even the situations they try and make their adherents open to (how a group should deal with change, outsiders, etc.) are locked-in. They can’t grapple with changing types of change or the presence of other myths that grapple with changes in different ways. They could only work in a static or slowly changing world. Only more open-ended, agile myths will work: trans-myths. Someone please come up with a better name. Image appears on various blogs, I hope the owner, Simon Davies, doesn’t mind. 1. ↑ Obvi these are super-rough. There are examples that blur the boundaries, that mix and match and of course there are sub-types within all these types that also represent important distinctions, yada yada, yada. 2. ↑ The custodians are interpreted in some progressive circles as owning the IP of the myths, but perhaps it’s more accurate to say they are the IP. 3. ↑ Hence if you want to judge the institutions of science, you use science studies or the sociology of science, not Aztec myth or even a great fiction from the past like King Lear. The cultural myth and the fiction simply don’t have any content capable of grappling with the new “myths” of science. The reason, obviously, is that they were composed before the advent of professional science so couldn’t incorporate anything like the high-level, abstracted, generalisable, relativistic perspective found in modern social science, legal theory, philosophy, and so forth. Sadly, this also means that traditional peoples struggle to analyse the colonialists and anthropologists who analyse them — and also classify them, rule over them and, in the recent past, exterminate them. Also sadly, even governments who have belatedly, begrudgingly — and often deliberately ineffectively — tried to help preserve traditional cultures, have often failed to recognise that they’re not static either. Recently I’ve been checking out anthropologies written by members of a traditional culture, that are able to gain more access to that culture than would outsiders and also comment on anthropology. Pretty interesting.